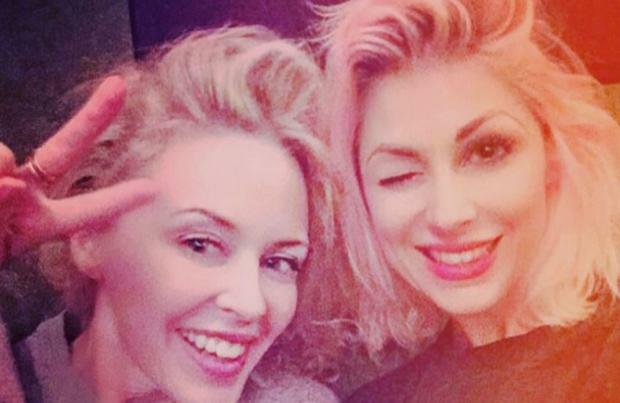 Kylie Minogue is working with Katy Perry's regular collaborator Bonnie McKee on her 14th LP. The 47-year-old singer spent the weekend writing songs for her forthcoming studio album and had a studio session with Bonnie, who as well as penning several hits for Katy has also worked with Rita Ora and Britney Spears among other artists. The pair were in studio on Sunday (10.04.16) and Bonnie took time out to share a selfie with the Australian pop star on her Instagram account. Alongside the pic, she wrote: "Just @kylieminogue without a stitch of makeup looking like a goddess. blissful day at the studio yesterday w Kylie and #cutfather #danieldavidson #peterwallevik. (sic)"
Bonnie has co-wrote some of Katy's best known tracks, including 'California Gurls', 'Teenage Dream', 'Roar' and Last Friday Night'. Kylie has also been back working with Cutfather - a Danish producer who helped Kylie with her 'Fever', 'X' and 'Kiss Me Once' records. Hinting at what fans can expect from her next LP, the follow-up to 2014's 'Kiss Me Once', Kylie said: "I could see myself going full pop after this. Getting back to my dance/pop roots. I don't even know how they know, but fans post messages when it's the birthday of this song or that song. I don't keep track of it, but recently it was the 12th anniversary of 'Slow'. I think back to songs like that and I go, 'Yeah, I'd like to do that again.' "